Hats off to Autocar for once again getting the inside line on Gordon Murray’s much-anticipated T25 city car. Yesterday it released a superb spy shot of a matt-black T25 on the prowl in darkest Surrey. We suspect little real spying was involved – we sense instead some mutually beneficial murmuring between Murray’s PR flacks and Autocar’s hacks, but nonetheless we are delighted to finally clap eyes on the little beast. As expected, the car has a wheel at each corner and manages to overcome its cramped dimensions to look both purposeful and dramatic, rather than dumpy and tall. To our eyes it’s a sort of cross between Murray’s seminal F1 supercar and a Lancia Y10 supermini. But maybe that’s just us. The T25’s party piece is also finally brought to light – entry and exit is not so much via door as by canopy. The whole front of the car, from the B-pillars to the scuttle, hinges up and forward, raising the windscreen, side windows, roof and what we might normally call doors out of the way in one swing. I guess we know where old ones will leak in the rain, assuming any are ever built. 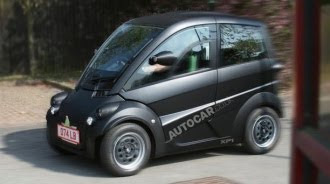 As far as we know, Murray has yet to secure a partner to put his tiny three-seat city car into production. The car in the photo is marked “XP1” on its sill, presumably standing for experimental prototype number one (although it is actually the second test vehicle). We sincerely hope that Murray manages to push his vision beyond the XP stage.